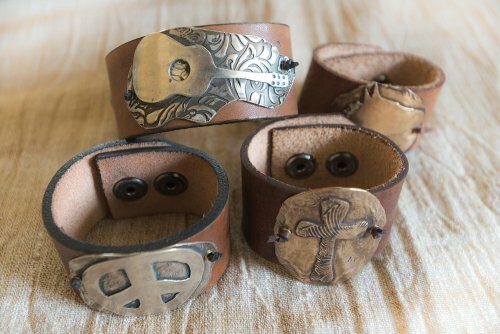 Annie Parker started making her rustic cuffs less than a year ago, and the response has been much greater than she expected. The cuffs are a must-have jewelry item for many South Walton visitors and locals, and are made for the wrist of a man or woman. As a matter of fact, one of her cuffs has been worn on the TV series Nashville by Charles Esten, who plays Deacon. 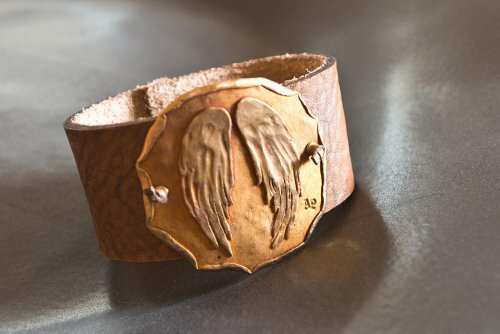 Annie's cuffs have a main design element made of bronze, copper, or silver - which is then fastened to handmade leather cuffs. 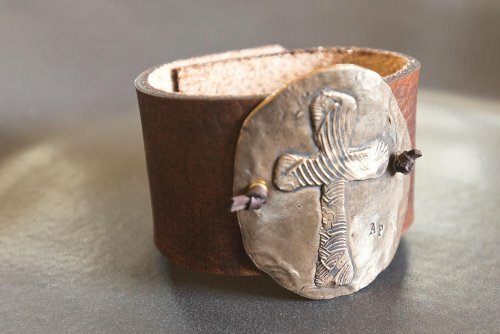 Her designs are inspired by her life experiences and include horses, angel wings, boots, guitars, and crosses. Annie is a southern girl and her designs reflect her roots. She loves farm life and all things beach. She's also a big fan of music - especially if it comes out of Nashville. Each of her pieces is unique and made lovingly by hand. She also creates custom designs for folks looking for a unique piece or a special gift. Annie Parker Jewelry is already sold in many stores. You can find her cuffs in Florida at Mercantile in Seaside, Big Mama’s Hula Gallery in Seagrove Beach, Boca Boutique and Galeri in Destin, and Surroundings in Destin. Outside of Florida her cuffs are carried at Burlap Ranch in Tomball, TX; Two Old Hippies in Nashville, TN; and Gammy Designs in Ontario, Canada. Annie is one of the owners at Gulfside Trail Rides and Stables in Santa Rosa Beach where she lives and works. The cuffs are also available for purchase at the stables. She spends her days making jewelry, riding horses, and playing with her two Jack Russells - Bogey and Digger. Annie goes through quite a process to make each piece. First, she rolls out the Precious Metal Clay or PMC and forms the base into the shape she chooses. Then, with limited time before the clay dries, she carves the design and the pieces are dried over PVC pipe creating a slight curve. Once they have completely dried, Annie sands any rough edges away and puts them in stainless steel pots with a carbon mixture and into the kiln they go. After about eight to nine hours the clay adhesive is gone and all that it left is the silver, bronze, or copper - and a beautiful design.The last step is when Annie attaches the metal design to the leather cuff. 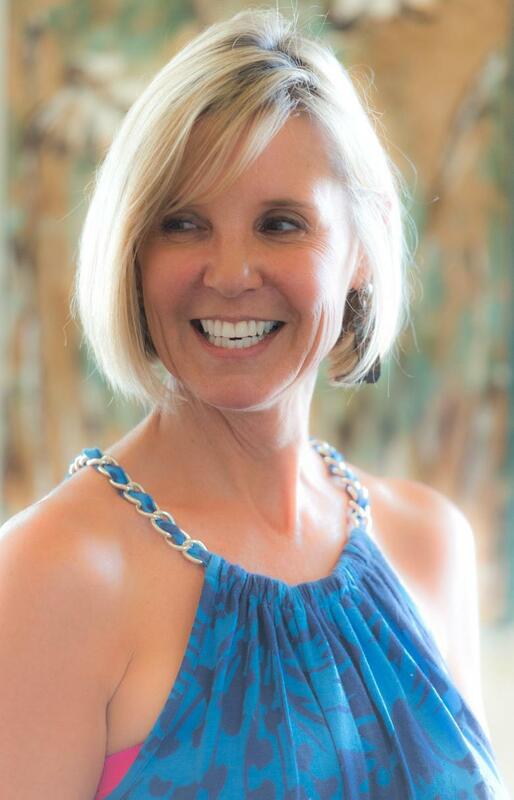 Annie Parker Jewelry is booming and it likely won’t be long until you see it all over the Southeast and beyond. Get yours soon! Check out Annie's designs at www.annieparkerjewelry.com.